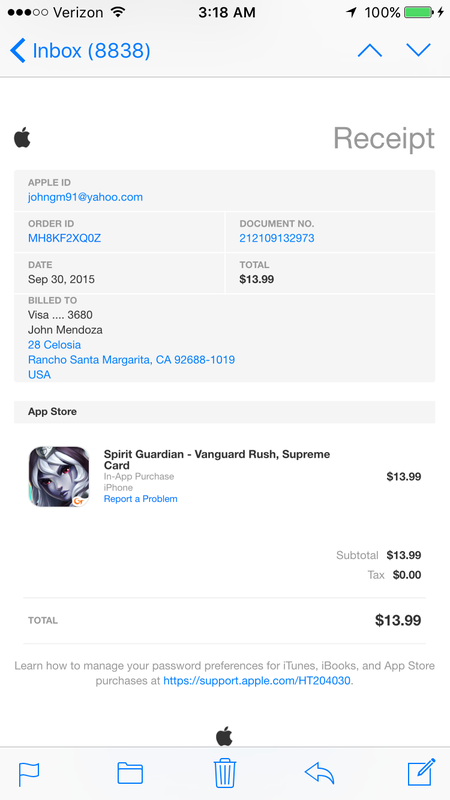 I had submitted my ticket on the mobile game Spirit Guardian and they wanted me to post a image showing my receipt on this website. By the way, my character ID is 8074 if that\'s any help. Here is my receipt and hopefully we can get this issue solved. I believe I did everything on my end with this issue so I guess from here on out I\'ll be waiting for you guys to fix it on your end. Thank you. Can you guys please stop ignoring me and help me out. Here is the proof of my order! If you check my game account you will see that I didn\'t receive the Supreme card or my 1800 diamonds!! 2019-4-21 23:00 GMT+8 , Processed in 0.053012 second(s), 38 queries .